Brodie Retallick and Conrad Smith have been ruled out of the All Blacks squad to face Scotland at Murrayfield on Saturday. Retallick sustained a shoulder injury that forced him to depart the 24-21 win over England at half-time, while Smith has returned to New Zealand to attend to a family matter. Steve Hansen expects Smith to return for the final Test of the tour against Wales on November 22. "It's not overly serious, but serious enough for him to have to go home," Hansen said. "Everyone's healthy, which is great, but it's a personal matter so we can't answer any questions on it." 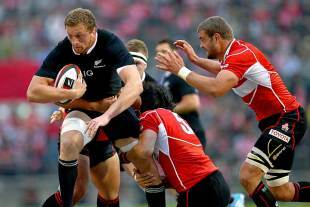 Retallick is ruled out this week, but he is expected to be fit to face Wales. Dominic Bird has been called into the squad to replace Retallick, having recently featured for the Barbarians against Australia, but he is unlikely to play at Murrayfield as the All Blacks are well stocked at lock. Retallick and Sam Whitelock started against England, while Patrick Tuipulotu and Jeremy Thrush ran out against the United States in Chicago a week earlier. Luke Romano is also on tour, and Hansen says he is fit for selection this week. Romano played the latest of his 16 Tests a year ago, as he broke an ankle playing Super Rugby for the Crusaders in May. Hansen said openside flanker Sam Cane was also available to face the Scots, having been ruled out of the England Test due to back spasms at training last week.